Velondonista is St. Petersburg-born girl living in London. 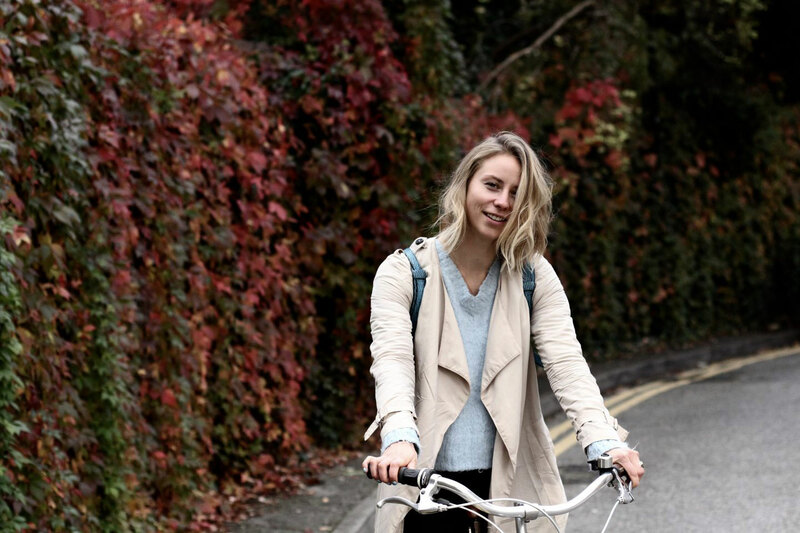 Janna Brom, a Russian émigré living in London, runs a blog about women’s fashion and cycling in London. She says her primary goal is to encourage more Londoners to ride bikes — and to look stylish while doing it. Elena Bobrova of RBTH spoke to Brom about her life in the UK, differences between Russians and Brits and her favorite places in London. RBTH: How many years have you lived and cycled in London? Janna Brom: I was born in St. Petersburg and grew up in the city center. When I was 15 my parents moved to the UK. We first lived in Norwich, but about seven years ago I moved to London. Of course I was cycling around when I was a kid in Russia at our dacha [summer house]. But I’m using bike as a transport, because I started to ride it to my work. RBTH: When did you start your blog? And what was your motivation? J.B.: The reason behind the Velondonista is to encourage women to cycle more. The idea behind the name comes from a play on 3 words: VELO – meaning to bicycle in various languages, LONDON and fashionISTA with the blog providing content and tips within all three categories. I’ve been cycling for four years, and when I just started, I’ve realized that there is not so much information on how you should cycle safely. Even in the Highway Code, just a small section is devoted to bikes comparing to car and pedestrian regulations. I felt there is no guidance for that. A lot of people just cycle for sport, but not on a daily basis. I couldn’t find any inspiration what could I wear when I’m on the bike, because I didn’t want to wear lycra or specific sports clothes. I wanted to wear my normal clothes. I was looking for those websites for several years and couldn’t find any. So one day I thought that I just need to start my own blog. I started to make photos of girls on bikes, take small interviews. My trip to Copenhagen influenced me a lot. I was so impressed by cycling infrastructure there and thought “why London can’t be so welcoming for bikes?” So I’m running my blog for a year now. RBTH: What do you do beside your blog? Where do you work? J.B.: I used to work at Sotheby’s auction house at the department of Russian art. I was doing financial analysis there and was in charge of organizing auctions. But now I work at MacMillan publishing house. RBTH: What did surprised you the most in London and the UK? J.B.: People don’t wear many clothes, many people don’t wear tights. That was a big shock for me, because it could be just 10 degrees outside and kids were just in socks and skirts. It took some time for me to acclimatize to it. Also everywhere is super cold inside comparing to Russia. They don’t really have as much heating. Speaking about the culture, I can’t really point something special. Because I used to travel a lot before moving there. Overall I love living in the UK. In London, I was surprised by transport. It’s loved and hated at the same time. London’s underground is the oldest in the world, it’s efficient and reliable. But at the same time, you can face so many problems there. You can be stuck in the train for quite a lot of time and then you are constantly late because of that. London is also very multicultural. Before I was thinking that it’s very British, but then you realize that everyone is there – representatives of all colors, all cultures, all nationalities. And you don’t feel as a foreigner there, which is really good. RBTH: What are main differences between Russians and Brits? J.B.: It’s hard question! I feel myself that when I speak English I’m becoming a more charismatic person. There is a lot of hand and face movement. While Russians are more reserved and don’t show their emotions. But then they can be really warm if you get to know a person more closely. That’s why a lot of foreigners don’t understand Russian culture. British people are really open, while it’s a bit hard to “read” Russians. But they will open to you if you speak to them in Russian.